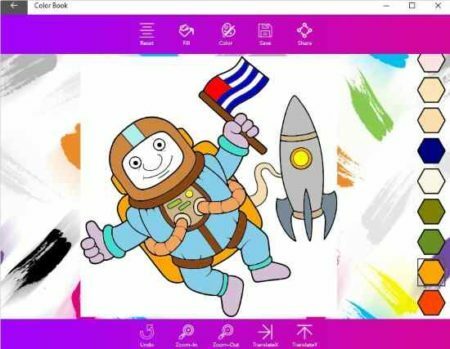 Coloring Book for Mandala is a Windows 10 coloring book app which has lots of pages to color for adults, as well as kids. The app has pages under different categories like animals, fashion, space, transport, culture, holiday, marine, and sports. There are lots of coloring pages under each category. 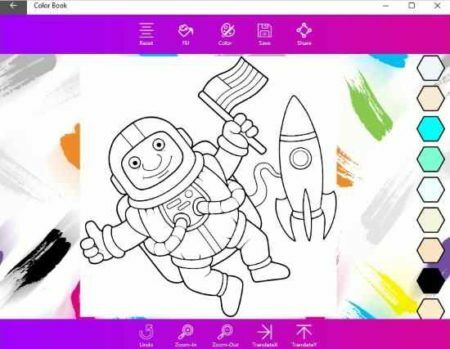 The Windows 10 coloring book app can be downloaded from the Windows 10 store or from the link given at the end of this article. When you start this app you will come across an interface like the one shown in the screenshot below. From the above screen click the patterns tab and you will be taken to the categories page where all the coloring page categories will be shown. This can be seen in the screenshot below. The various categories available for coloring are animals, sports, fashion, culture, holiday, marine, transport, and space. 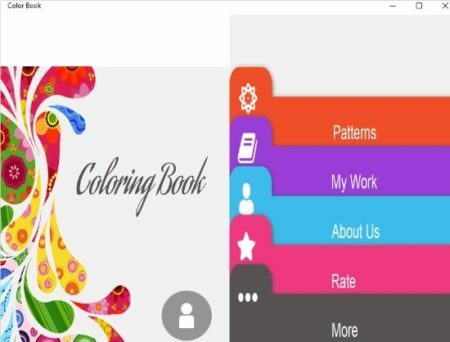 You can explore the coloring pages and designs in each category and see which one you would like to color. You can choose a easier one for the kids, while adults can choose one of the more complicated designs to color. When you click on a category name all the coloring pages inside that category will be listed, as shown in the screenshot below. 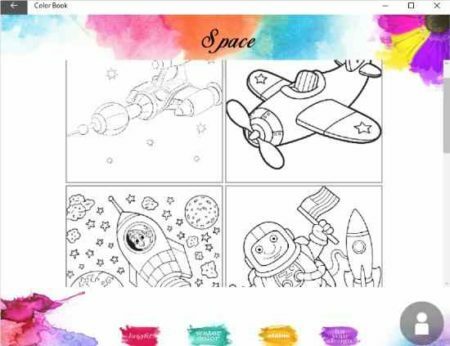 Out of the listed coloring pages you can select the one which you would like to color. Once you click on a page it will open up in full screen, as shown in the screenshot below. You will get lots of colors on listed on the right side of the page. You can select which color you want to fill into the picture. The top toolbar gives you some options like fill color, this option will let you fill the color you choose in a particular area. Next to it is color option which will let you choose more advanced colors which are not available in the right side listed colors. 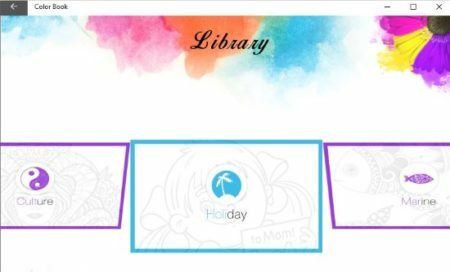 The save option will let you save the colored page in JPEG format to your computer. The share option will let you shared your colored page through various mediums. The bottom toolbar has the undo option to undo any mistakes you made and zoom in and zoom out of the image option. The above screenshot displays a colored page. Lots of coloring pages for kids and adults. Coloring pages divided under various categories. Lots of colors available in the color palette. Zoom in and Zoom out option for detailing. Save colored image in JPEG format to your computer. Extra color palette on top to customize colors. Great way to relax by coloring. Brings out the creativity of a child. Coloring Book for Mandala is a real nice app for coloring and having some fun. Kids can enjoy coloring various pages which will bring out their creativity. Whereas, for adults coloring can be a relaxing activity after a hectic day of work. The best part is that you can work on these pages even when you are offline. You can also use it as a family activity and involves kids and adults at the same time. Check out Coloring Book for Mandala for Windows 10 here.